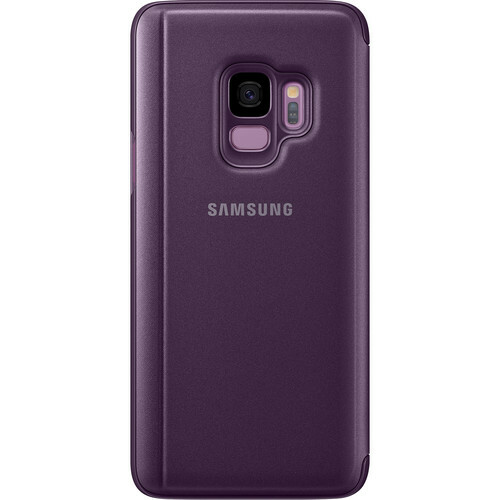 The S-View Case for Galaxy S9 from Samsung is a folio-style case that features an interactive front cover that lets you see and interact with your S9's screen. With the case closed, you can view information, such as the time, battery status, and the date. You can also swipe the case to respond to incoming calls, active alarms, and events. The folio cover has an additional section that you can flip out to form a kickstand to prop up your phone in a landscape orientation. No matter where you are, you can setup the phone for hands-free viewing of videos, and monitor notifications. Your S9 snaps into the S-View folio case and is protected on all sides from the wear and tear of everyday use. For your convenience, precision cutouts give you access to the S9's camera, buttons, and ports. Box Dimensions (LxWxH) 7.65 x 3.55 x 1.0"
S-View Case for Galaxy S9 (Violet) is rated 3.7 out of 5 by 9. Rated 5 out of 5 by Mquinn315 from Great features for this product Love the new look keeping in the "NOW" look as far as futuristic looking it is spot on. Can't get over how Samsung hasn't disappointed but how they have surprised the customers once again with a spectacular phone. Rated 1 out of 5 by Jel9 from Opened mid fall I bought this case 10 months ago. The seal wasn't tight and today as i was getting out of a car it slipped out of my jacket pocket and fell on the ground opened. Now my phone has a huge crack because the case opened and failed to do what it was bought to. The cost of a repair is too much and I bought the case to avoid future costs of such an expensive phone. Rated 4 out of 5 by AC Jr from Good case but... The case is pretty good but its doesn't appear to be wireless charge friendly. When I place my phone on the charge with the case on the charge doesn't "find" my phone sometimes, when the case isn't on there isn't an issue. Rated 4 out of 5 by KDOTHLD from Customized text individual ringtones This is the only phone that I've owned that I cannot customize an individual's text ringtone!!! Why!???? Please please please fix!! I'm sure I'm not the only one you'll hear from about this . A lot of people depend on this feature!!! Rated 4 out of 5 by 4catlady from Nice but-- computer klutz here-- Had a flip cover for my S5 & liked it. When upgraded to S9 got the corresponding flip cover. It does the job for protection and is easy to clean. Had problems figuring out the settings to get some of the features, but that may be just me. It does make the phone + case a bit heavy, Overall a pretty good case/cover. Rated 4 out of 5 by JP from Not what I was expecting but pretty decent This is not what I was expecting most likely because I convinced myself that it was a "leather" folio type that I was used to. ?This has a high gloss see-through front that allows you to see the time stamp and other notifications or with a swipe other items like when playing music. ?I was first not keen on the very plastic look but it has grown on me. ?I will say that of you do not like wiping ?fingerprints or dust (seems to attract it) a lot then you may want to keep searching. Rated 5 out of 5 by Elizabeth from Convenient case Fits well, protects, attractive, no need to remove for wireless charging or to use DexPad. Was also able to add a screen protector without any issue. Definitely recommend with BH pricing.